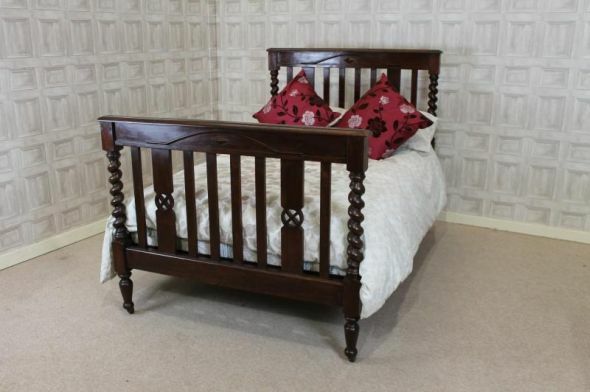 A lovely example of a circa 1910 Jacobean revival solid English oak Edwardian double bed. Featuring a slatted and decorated headboard with matching footboard, this bed also has large barley twist columns to all four corners. This truly is a substantial piece of Edwardian bedroom furniture, and the bed is ideal to complete any period bedroom interior. It is also a great quality stand-alone piece. It comes complete with a newly made pine slatted bed base, so all this is required is a standard double mattress. Please be aware that this is an antique piece of furniture, and it will show signs of general wear and tear.